Most of these chapels extend into the nave, but some (e.g. the St Columba chapel) are self-enclosed. Several of the chapels are dedicated to saints with special associations to Liverpool: St Martin de Porres is the patron of LAMP, St Columba, apostle of the North of England. Others have para-liturgical / devotional uses such as the Reconciliation chapel and the chapel of the Holy Oils, leading towards, but not detracting from the heart of the liturgy. In the liturgical sense, primary among the chapels are the Blessed Sacrament chapel and the Baptistery. The Blessed Sacrament chapel’s principal liturgical roles are twofold. It is the secondary worship space for use with smaller congregations. 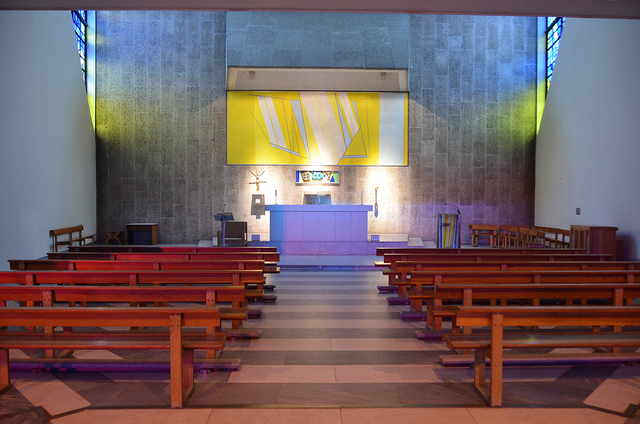 Daily mass is said in the chapel that lies on a direct axis behind the high altar and the cathedra. 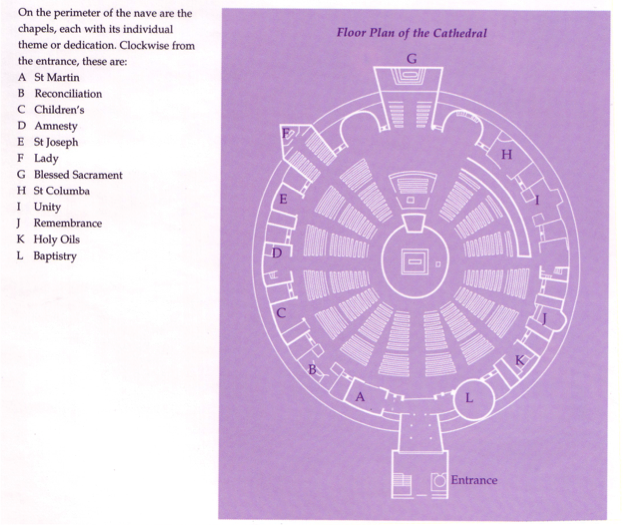 Its primary liturgical function however, is that it houses the tabernacle which contains the reserved sacrament. 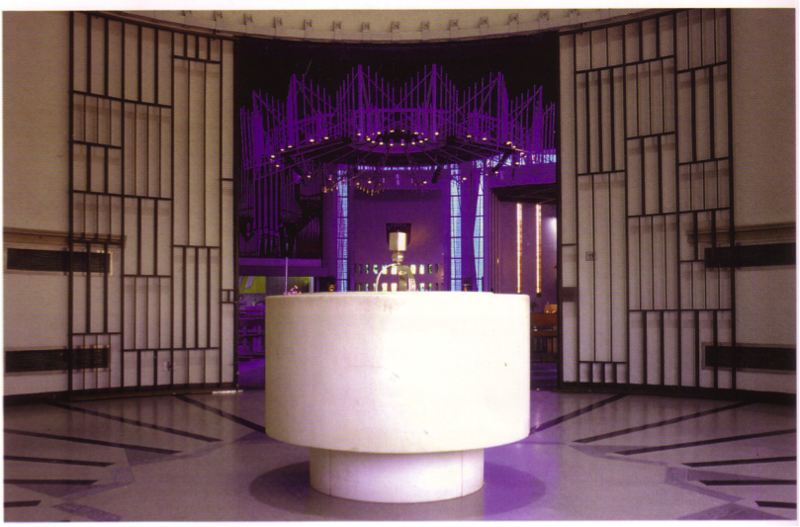 The decision to place the tabernacle in a separate chapel, and not on the high altar as was normal in Roman Catholic churches before Vatican II was common in Cathedral churches. Whether or not this statement influenced the cathedral committee directly is unknown, but what is abundantly clear is that they have subscribed to both the theology and praxis of a separate baptistery. The font, made from the same marble as the high altar, lies in an enclosed baptistery of around five hundred square feet along the perimeter wall of the cathedral in a setting that clearly illustrates the importance of the sacrament. 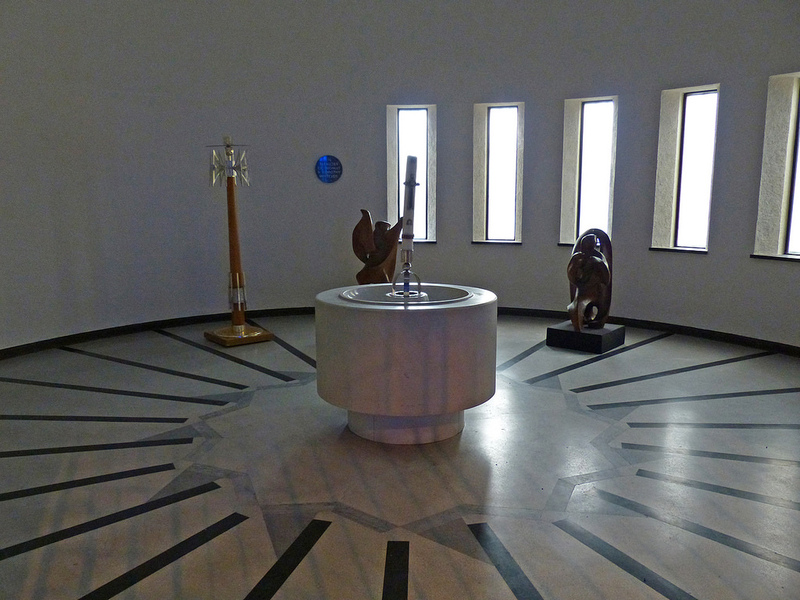 Today opinion is divided as to the question of whether the positioning of the font in a separate baptistery is conducive to the idea that initiation is the responsibility of the whole church. The primary motivation for the desire today to have a more prevalent baptismal area stems for the success of the Rite of Christian Initiation (RCIA.) However as this rite was not released until 1972, this movement was not strong enough to affect a change in Liverpool. 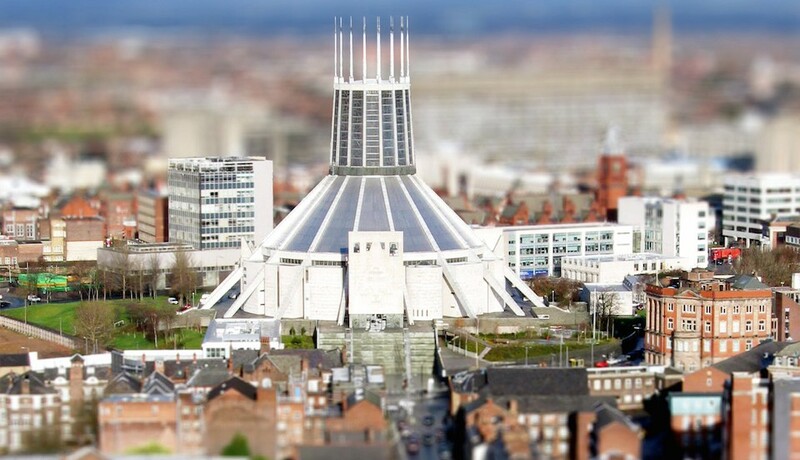 However that the debate was already in focus in the early 1960’s is apparent from Gibberd’s own words: ‘Clearly Liverpool rejected a modern tendency to regard the sacrament of baptism, or re-birth, as being one which involves the whole seated congregation and not merely a group of relatives and friends.’ He goes on to outline the difficulties that would have been presented by having the baptismal font as a liturgical focus in the nave of a circular building, detracting as it would, from the altar. By Christopher McElroy in Uncategorized on November 18, 2014 .